There have been 300 images uploaded to this topic. (View topic image gallery). There are 1870 posts in this topic. You are on page 16 of 38. I must have glazed over this. What was your hope/request for this? 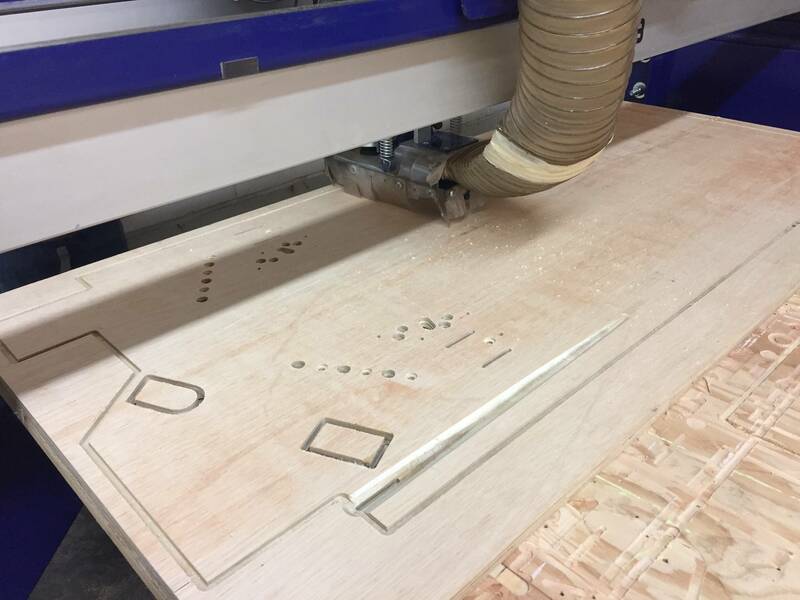 Just a blank PF cut with holes for the standard 'Italian bottom' playfield? Or fully populated with flippers and laneguides and whatnot? 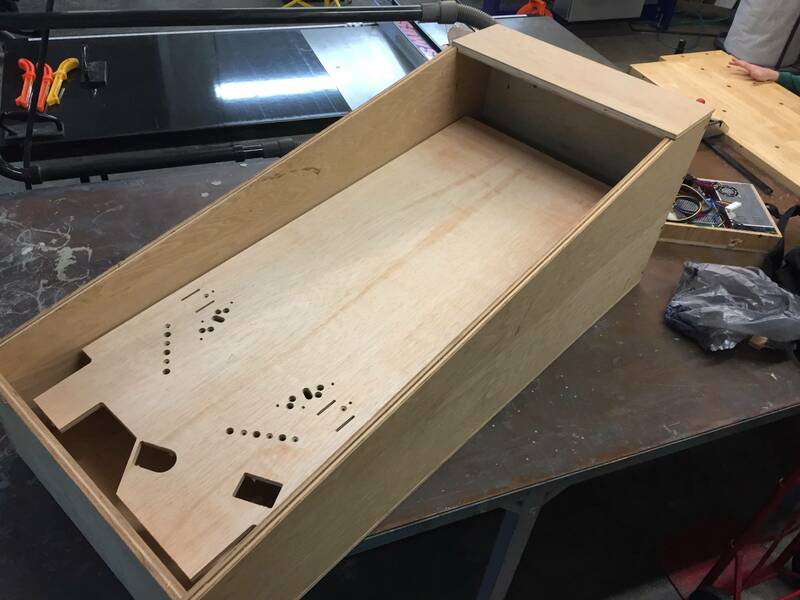 just a piece of wood setup with a regular Italian bottom lower third with cut holes for inlane/outlane switches, flippers, ball trough, and dividers and a shooter lane pretty much the super basics... maybe some cut outs for inserts at inlane/outlane/ball save? I'll look into it and see what kind of price it would entail as I'm hoping to start cutting PF's myself first by hand, then with a local vendor. Shipping will hurt I imagine, but if I get a few extra PF's made, with our CDN dollar being such crap, and local manufacturers begging for work due to crap oil prices, it could be cheap and easy for you to buy from Alberta lol. Is anyone else interested in this? If I can verify the layout of my 'standard' PF in the next few weeks, I could look into running 5 to 10 to 20 to ??? extra PF's and estimate out the shipping costs in the meantime. I could be interested in this, depending on the total cost ofc. Live in norway. This thread hasn't seen a lot of action lately so here is an update of my pinball software that I am working on. Obviously still in development but it'll be a client-server architecture. Machine can run standalone as a normal pinball machine with the server software but then for testing/designing purposes the client can connect from a different computer. here is an update of my pinball software that I am working on. Obviously still in development but it'll be a client-server architecture. Machine can run standalone as a normal pinball machine with the server software but then for testing/designing purposes the client can connect from a different computer. Ooh nice. So is the WPF just the visual playfield layout portion, and you're using Caliburn.Micro and MassTransit just to tie together the .NET framework? It's like an open source version of jersey jack's system. 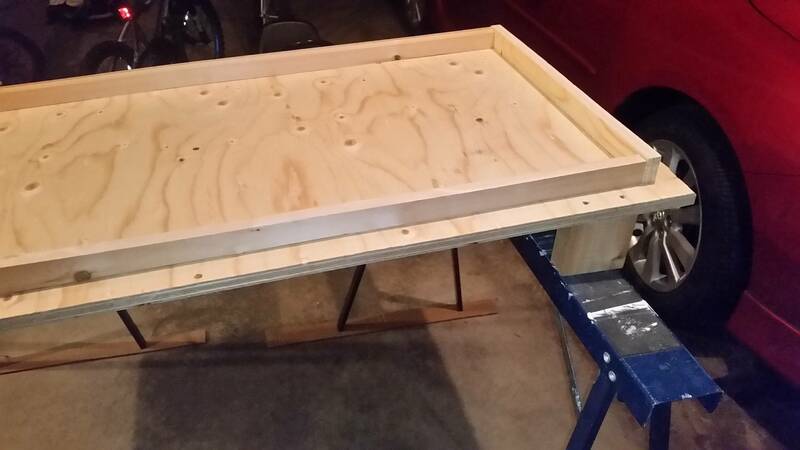 So I figured out how to build a whitewood really easily: Wait for Heighway to do it, and then work on the art for it. I have an executable that runs on the client and one that runs on the server. Both use WPF, all of it is C# and .net. Caliburn.Micro is a lightweight framework with great support for MVVM applications (Model-View-ViewModel pattern). It has a built in event aggregator, automatic binding conventions between the View and the View Model, plus some other great stuff. Mass Transit is a service bus that I'm using for the communication between the client and server. It serializes my C# objects to Json and sends them between the 2 applications. Common - Few common classes but mainly the Devices and objects that get sent between the server and client. DataContracts - Interfaces that define what will be sent between the server and client. ServerLibrary - The guts of the server side. Does all the talking to the pinball hardware. I've only seen Jersey Jacks LCD display in action on a pin so can't really say what support software they provide. If it is anything like what I am making it does sound quite interesting. You just gave me wood, and the only cure is more cowbell. I noticed on some of my early Bally SS games (paragon, Electra) the v-groove seems to be cut with a 1-1/8" diameter cutter and the ball seems to ride in the bottom of the groove. On my early Williams SS games (Pharaoh, Solar Fire) the v-groove seems to be cut with a 1" diameter cutter and the ball seems to ride on the sides of the groove. What have you guys/gals found? I suppose it depends if you want the ball to bear on 1 point or 2 points. 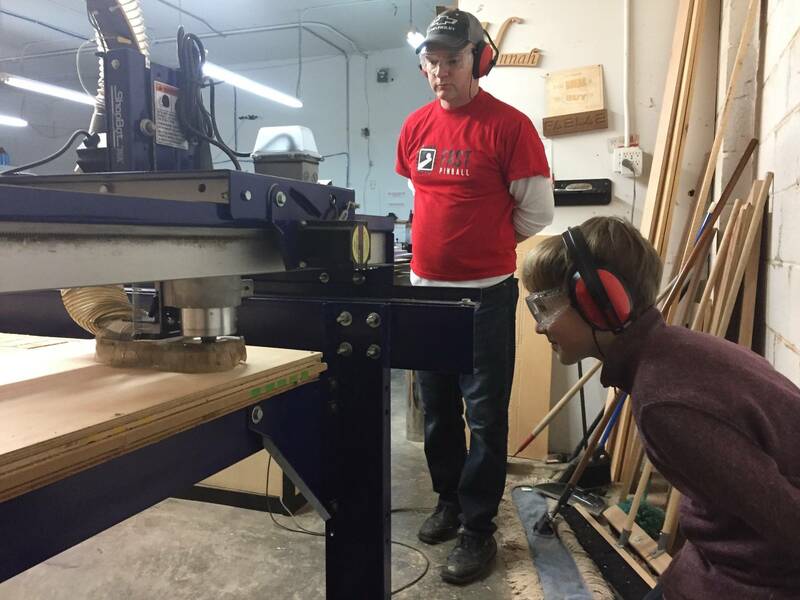 A regular ball is 1 1/16" so if the trough was cut with a 1 1/16" or larger bit the ball will always rest on one point only, but the bigger the bit the more the ball will effectively rock around a little. Having a 1" inch cut in theory will direct the ball to the centre of the v-groove but bear on 2 points of the ball at the top of the playfield cut which in effect the groove depth isn't doing a lot but looking nice and steading the ball to shoot up the centre. here is a sketch of a 1 1/16" ball in a 1 1/8" v groove. Ideally, you want the 1 1/8" size trough because the ball ejecting into the same spot wears a hole into the side of the trough. If you wear a hole into the side of the 1" trough, the ball will deflect slightly each time it is launched. I was more curious about what others were finding on legacy designs. I've hand made my first Italian bottom prototype with flippers, slings, and inlane guides. Once I get it wired up and flip a few balls around to make sure it feels good I'll finalize it in cad and get it quoted somewhere here locally. Maybe make a template from a stern machine. Looking from the bottom, the important part is the intersection point where the rubber crosses the slot vs the posts. 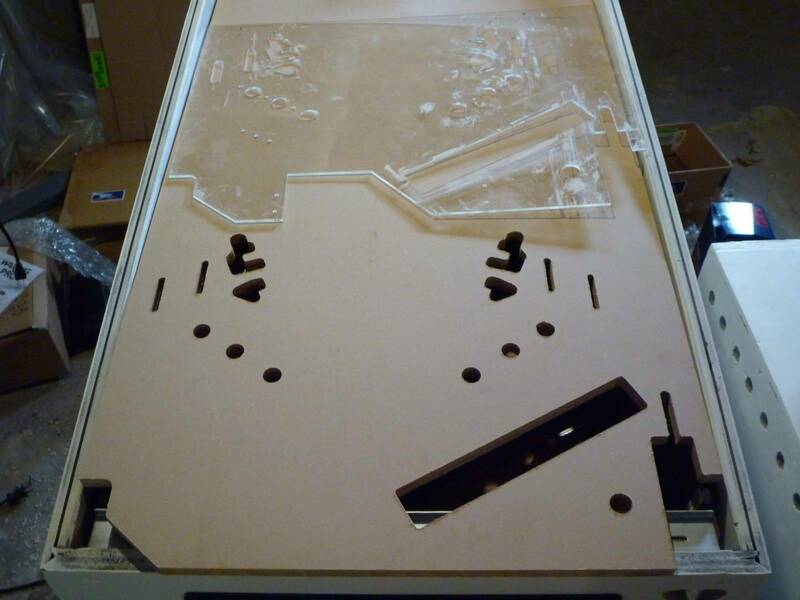 The trouble is related in part to the cutouts relative to the rubber, but also to the placement of the mech itself from underside the playfield. The second issue is I don't want to use Stern posts for my slings, and starposts do make an appreciable difference to the inlanes and sling rubber positions when you get down to the ~1/16" scale. Essentially, in short, Stern 'Italian bottom' is not the exact same as WMS - which frankly doesnt shock me and I anticipated such a hiccup; The inlane guides are slightly different, and the sling positioning is slightly different. They are functionally "identical" for 99% of gameplay purposes (as far as the average guy could tell at least) but they are not necessarily part-compatible, and as far as readily available whitewood parts, it's a mix of what's "off the shelf" these days. Overall not at all a big deal. Just a small initial nuance to laying out a whitewood. I've thought about using the sega/stern sling mech for a while because of it's mounting simplicity. Mounting a B/W mech is a pain since it's 2 parts. I haven't made the switch yet though and because of those reasons you've mentioned I have little reason to switch. 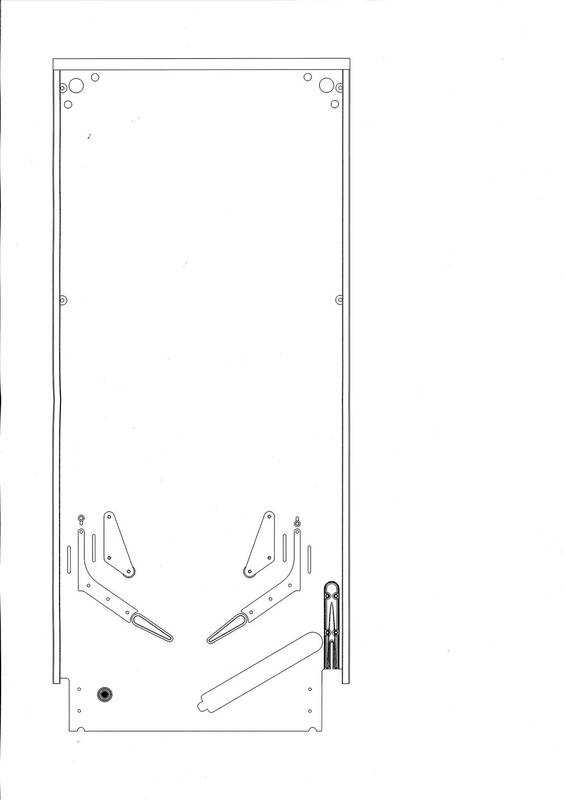 I to would essentially need to re-cad my sling templates which isn't really high on my list of things to do. I did the same with mine. DE/Sega stern is one piece with like 3 screws. I started with a 2 piece and it was nearly impossible to get it aligned correctly. Sega also has lots of VUK's up on marco. I started with a 2 piece and it was nearly impossible to get it aligned correctly. ... that's what she said? That's the mech I've used. 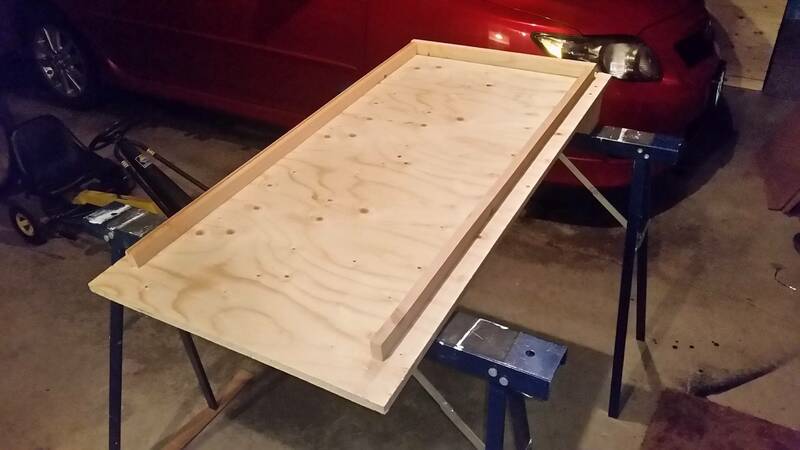 Works really well, aside from the aforementioned slight alterations to the WMS sling template. 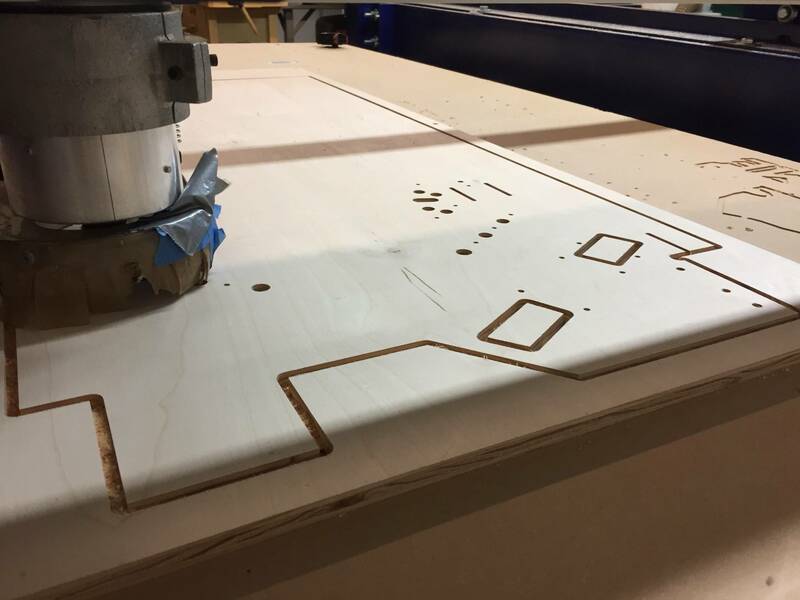 The tradeoff of not having to align multiple parts vs a slight change to the routing template is worth it imo. That's good info for those of us who haven't gotten to that point yet. Yeah, a stern sling template probably works 100%, but you'd have to mess around with the switches a bit if you want to use starposts vs stern posts; I tried changing my Metallica to starposts way back when slingshot airballs were an issue, and it works to lessen the slingshot forces but it does alter the switch closure sensitivity and the inlane feeds. There's a Stern template on the Pinball Makers site in the files section, for reference. I wanted to actually do this so will in the near future do a template of WMS plastic and post with a stern mech. Swinks, FYI I used your 3D printed sling templates. Cool idea and they worked awesome. Thanks for those - on to the pop bumpers! Should I be using stranded or solid wire? Does it matter? I don't own my own machine so I've never inspected the wiring. Thats why I asked. thanks for the info. Solid wire is usually used in homes because of the high amps (15-20), and because solid carries more amps in an equivalent diameter stranded. The most peak amps you'll see in a pinball is 4amps total, probably not much more than 1-2amps on any wire, which is why most wires are 18AWG. 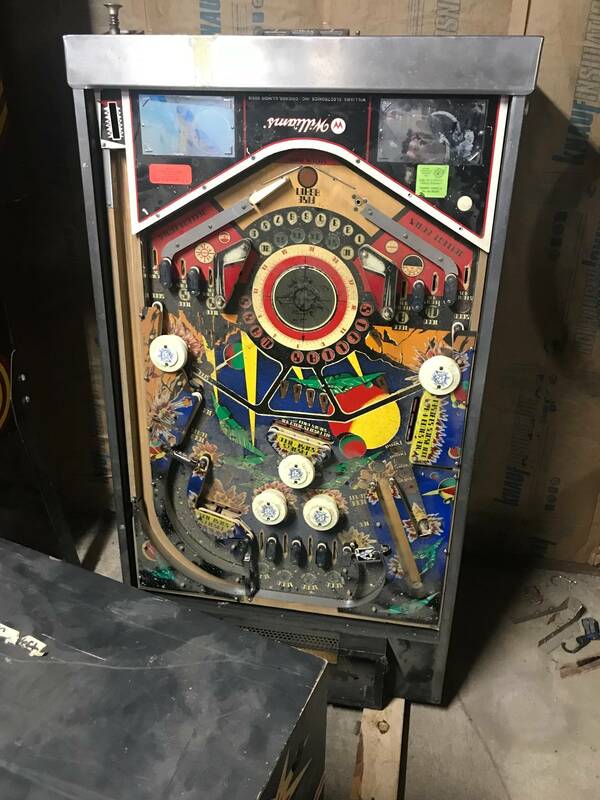 I would own / restore at least one pinball to get familiar with off the shelf parts before you tried designing your own. I tried that tactic and went down a really bad path quick. The other issue with solid wire is it's not the best choice for vibration and fatigue resistance. When have you ever seen solid wire anywhere in a pinball machine? 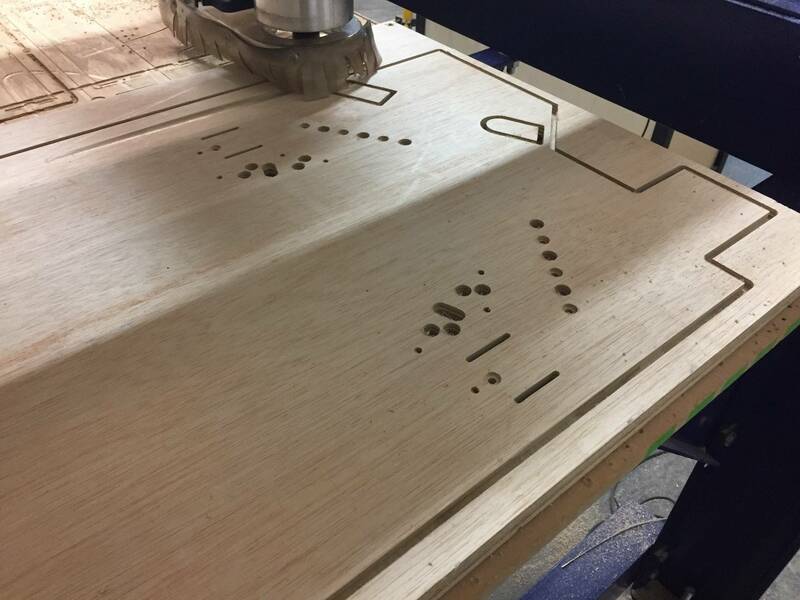 Using a laser cut router template to cut a generic lower playfield. 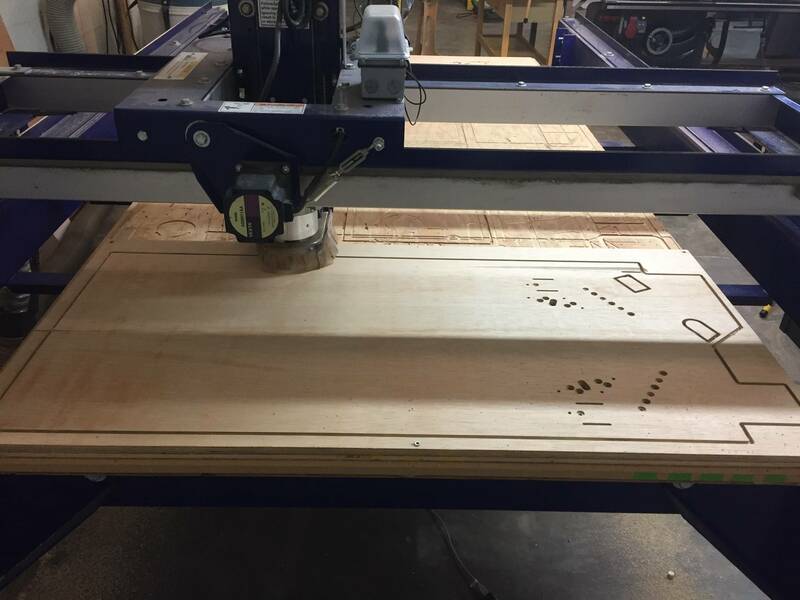 It's no substitue for a CNC machine, but works pretty well. If you want to try this spend the extra $10 or whatever and get the template in 1/4" MDF instead of 2.5mm acrylic! Nice, is that using a 1/4" bit? Can't wait to see it populated to see how things line up. 1/4" for everything but the lane switch and shooter slots which were 3/16". 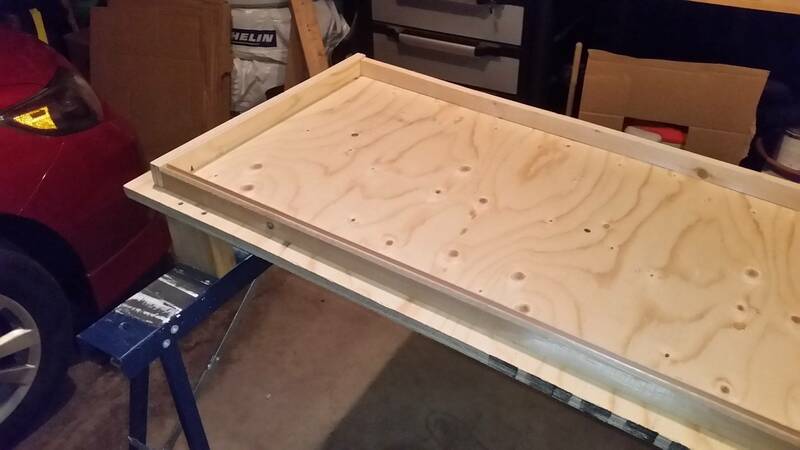 You can just clamp another playfield on top of your new blank and route out a perfect duplicate with a Pattern Bit. ...if you happen to have a totally blank playfield that matches what you want. You will notice trends that most playfields are identical for a certain era. 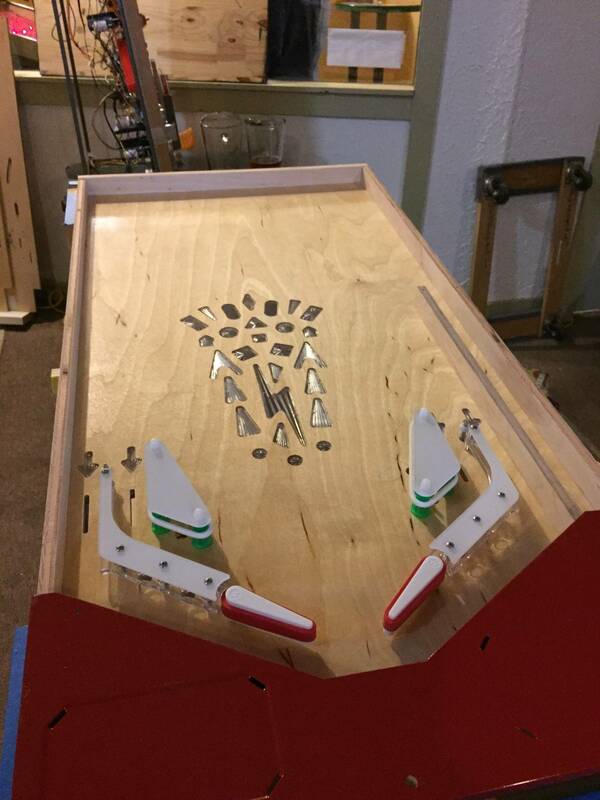 You can copy the flipper and in/out lanes verbatim, but then adjust the angle of the slingshots by moving the master playfield and re-clamping. Back in the day, Bally used to sell a blank playfield with the ball return and shooter lane already routed for $35. the problem with the pattern bit is it usually only comes in 1/2" diameter. Using anything smaller then 1/2 for the outer cut will wear out the blade very quickly. 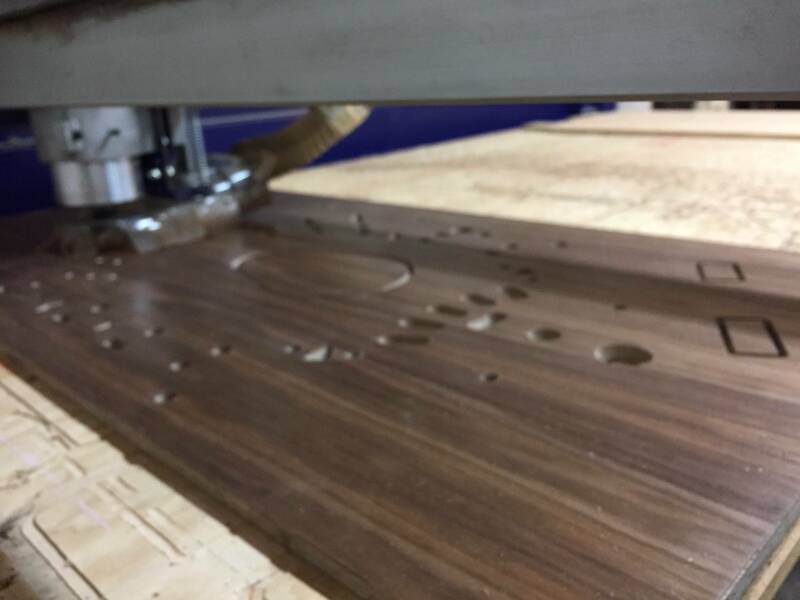 Anything larger then 1/2 will not cut some of the inner contours (of the outter shape) correctly. 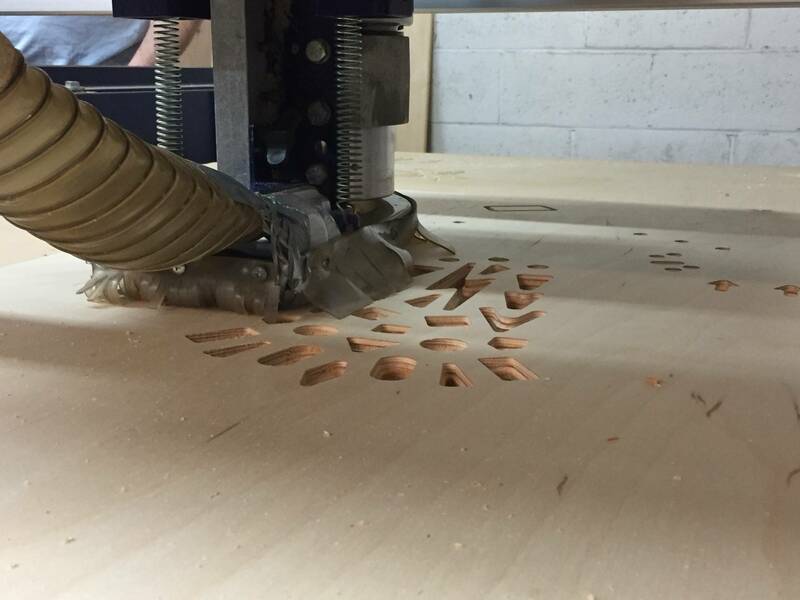 If you have a plunge router, then use that + 1/8th bit for the lane cuts. 3/16ths work too but 1/8th is the correct size I think. Could graphics be applied using printed rice paper and then sealed with a clear coat? I was checking out a mates surfboard last week and he showed me the logo that he applied under the fibreglass work. He printed a coloured design on to rice paper and then glassed over the rice paper and the printed design and the rice paper could no longer be seen. I am curious if this same approach could be done for possible playfield repairs but more curious for a one off designed playfield. This would be alot cheaper than trying to get a playfield screened and have not heard of anyone in Australia doing direct printing. 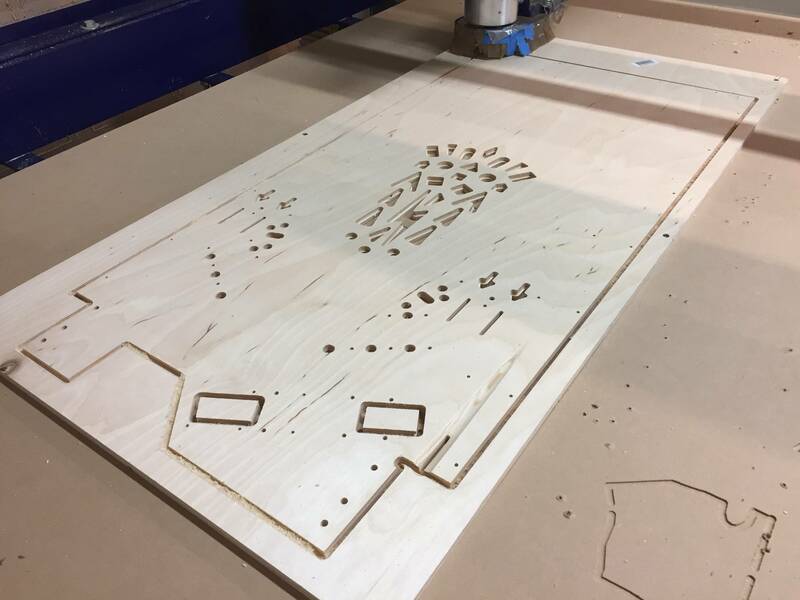 1. cut the playfield out and install inserts and apply a white coat to all areas of graphics to be applied maybe using a cut mask and then a clear coat ?. 3. possible apply one coat of glass over the art ?? 4. apply a few coats of clear ??? ?